Acne is one of the most common skin disorders, affecting people of all races and ages. It is a chronic inflammatory disease involving the pilosebaceous unit of the skin. Its prevalence among those aged 12 to 24 years is estimated to be 85%, although it can persist beyond young adulthood despite treatment. The disease is more common and more severe in males than in females. Don't scratch or pick the spots. Avoid excessively humid conditions such as working in an unventilated kitchen or tropical vacations as much as possible. Stop smoking because nicotine increases sebum retention, forming comedones (blackheads and whiteheads). Minimize the application of oils and cosmetics to the affected skin. Avoid sunburn and protect your skin outdoors using a sunscreen and protective clothing. Avoid abrasive skin treatment, which is likely to aggravate both comedones and inflammation. Follow a low-glycaemic, low-protein and low-dairy diet. Eat plenty of fresh fruit and vegetables. Establishing the type and severity of acne. Selecting medication appropriate for the patient's condition and skin type. In general, patients with oily skin benefit from solutions or gels, while those with dry skin do better with creams, lotions, or ointments. Educating the patient about the disease, the different types of medications and their side effects, and expectations for improvement that are realistic. Gentle cleansing of the affected area with warm water and a mild soap. If above treatments do not work, see your doctor, who can give you a prescription for stronger lotions or creams and, if necessary, antibiotic lotion. Drainage of large pimples and cysts by a doctor. Application of prescription antibiotic gels, creams, or lotions. Acne vulgaris frequently results in scarring. Acne scars can lead to physical disfigurement, having profound psychosocial impact on persons suffering from them. Early and effective treatment of acne is the best means to minimize and prevent acne scarring. The technique of laser resurfacing requires to direct short, concentrated pulsating beams of light at irregular skin, precisely removing skin layer by layer. This popular procedure is also called lasabrasion, laser peel, or laser vaporization. It burns the face to create a new skin surface and reduce acne scars, but complete remodeling takes about 18 months. It has been noticed that up to 45% of all patients have temporary changes in skin color. But infections are rare. The procedure is up to 80% effective for shallow scars. But deep scars can be treated in several ways before or during laser resurfacing. 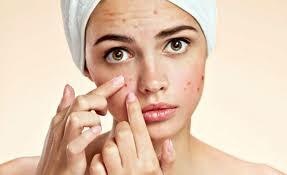 Acne affects 85% of all adolescents and about 12% of adult women. Although it is a benign condition, acne can cause considerable morbidity, including pain, discomfort and scarring. It can also lead to depression and anxiety resulting in poor self-esteem. Laser resurfacing is emerging as an effective new treatment for acne scars. Acne is a common skin condition that affects 85% of all adolescents and 12% of adult women. Besides morbidity, it may have a profound psycho-social impact on individuals suffering from it. And, therefore, it is important to manage it properly.